An Anaheim pipelining supply company, American Pipelining Technologies, has announced the launch of a new pipelining and repair system. This system allows for the quick and easy repair or relining of internal sewer pipes that previously were difficult to access or repair. An Anaheim pipelining supply company, American Pipelining Technologies, announced the launch of a new pipe relining and repair system. The company is a preferred local supplier of cured-in-place pipe (CIPP) repair and relining technologies. The company announced that it would supply plumbers and contractors with a new and innovative system to be used in the repair of pipes. The new system is suited to address internal piping where small pipe diameters and in-wall or ground-embedded pipe sections need to be repaired. It allows for the direct application or resin to pipes. Therefore, there is no need to impregnate liners, and get the liners in the pipe. Further, since no liners are involved, there is no need for any reinstatements after the liner is installed. . This new two component system is built on the PipeCaster Pro & PipeCaster Aqua dispensing pumps. These machines have the capacity to pump different resins, including pluyurea, polurethane, epoxy or silicate resins. They possess an innovative gear drive, that allows them to easily change from a one to one, one to two, or one to three ratio between the two components. They also have an adjustable volume dispenser, allowing the pumps to be used for applying resins to a wide variety of different pipe diameters. All of their moving parts are fully enclosed for safety. It is extra lightweight, but American built to be rugged. These units are mounted on “E-Z Ride” casters. They can either be plugged into a 110 outlet, or used with a battery. They come with training, a iron-clad warranty, and state-of-the-art servicing. 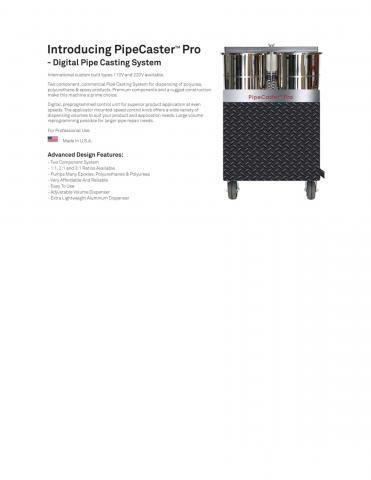 This system focuses on the use of PipeCast Flex and PipeCast Aqua two component resin. This is a newly designed polyurea resin. This is a fast setting resin that contains zero VOCs. It cures to tacky within 25 seconds. Once cured it provides corrosion protection and chemical resistance. It also provides excellent impact resistance even in sub-freezing weather. It adds to the structural integrity of the preexisting pipe, with a tensile strength of 3850 psi. It is also water resistant. Therefore, it can be applied even if the existing pipe is not thoroughly dry. It does not foam when exposed to moister or sitting water, as polurethane based resins do. Most significantly, this resin can be used in other manufacturer’s pumping machines. Ployurea resins have been around since the 1990s, and have established an impressive track record. They were originally designed to protect table-top edges. They quickly found that the resin is useful for coating large surface areas, such as in tunnels, tank linings, and now is used extensively on boat hulls. It has even been used as armorer. It has a life expectancy of 35 years. Organization: American Pipelining Technologies, Inc.